S.Y. Kitchen offers fresh, modern Italian dishes in any of the three rooms of their Italian-inspired California farmhouse. 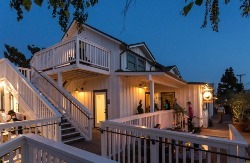 Dinner is served in the Front Room where guests are warmly welcomed; on the Porch with cushioned banquet seating and a bit of fresh air; or in the cozy Dining Room which also hosts family seating and private parties.